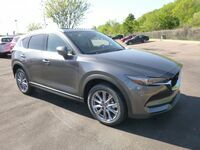 The Mazda CX-5 and Nissan Rogue have been competing in the hotly contested crossover SUV class for several years. This kind of direct competition has pushed both automakers to bring their best efforts to customers year in and year out. 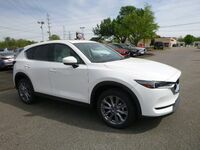 For the new model year, a comparison between the 2019 Mazda CX-5 vs. 2019 Nissan Rogue. Mazda has introduced a pair of new trim grades for its middle crossover SUV, Grand Touring Reserve and Signature. 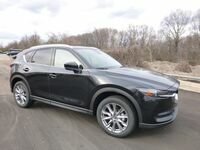 In addition to offering more creature comforts, the 2019 Mazda CX-5 also picks up advanced connectivity options that will only serve to widen the gap versus the latest Nissan Rogue. 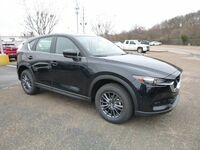 The 2019 Mazda CX-5 is currently available at the Gwatney Mazda of Germantown showroom. Customers can schedule a test drive today by calling, 833-241-6312. As the crossover SUV class continues to evolve, automakers like Mazda and Nissan are locked in an arm’s race for technology. By that measure, the 2019 Mazda CX-5 and 2019 Nissan Rogue both offer infotainment systems that are compatible with both the Apple CarPlay™ and Android Auto™ suites of applications. Additionally, both crossover SUVs employ a seven-inch touchscreen and offer a pair of USB ports. 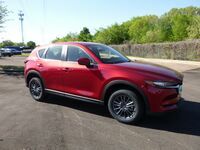 Where the 2019 Mazda CX-5 really starts to pull away from the 2019 Nissan Rogue is with drivability. Independent reviews have heaped praise on the two-row Mazda vehicle for having confident and engaging handling. By comparison, those same reviews have not scored the 2019 Rogue as highly. Specifically, handling and overall driving dynamics. The 2019 Mazda CX-5 can tow almost 1,000 pounds more than the 2019 Rogue. 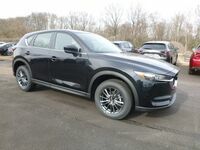 Gwatney Mazda of Germantown customers will be able to choose between two powertrains when they’re shopping for the 2019 Mazda CX-5. 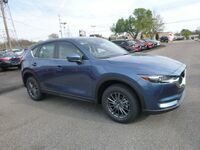 The entry-level Sport trim of the 2019 Mazda CX-5 uses a naturally aspirated version of the SKYACTIV®-G 2.5-liter, four-cylinder engine attached to a six-speed automatic transmission. It makes 187 horsepower and 186 pound-feet of torque. On the other hand, the 2019 Nissan Rogue is only available with a naturally-aspirated 2.5-liter, four-cylinder engine of its own, but it only makes 170 horsepower and 175 pound-feet of torque. For the most performance possible, the new trims of the Mazda CX-5 can add a turbocharger, which pushes the power output up to 250 horsepower with premium gasoline.